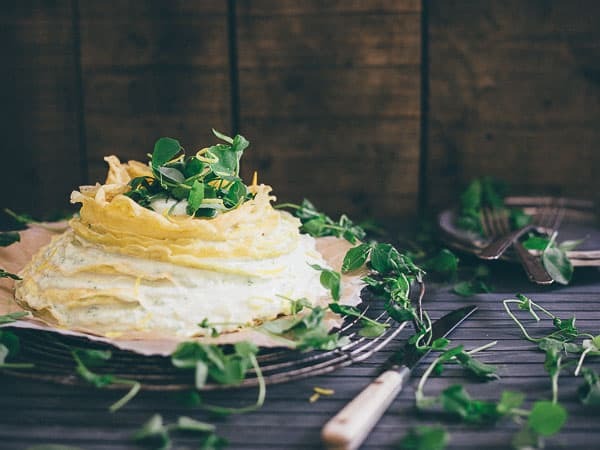 This sweet pea lemon crepe cake is made with grain free crepes and layered with a sweet pea, ricotta, lemon and creme fraiche filling making it the perfect spring dessert! Eating local seasonal produce as much as possible (I do live in New York, not California) has always been one of my “things”. When Ulysses brought home a bag of pears from the store the other day, I cringed. When he asks me to buy asparagus in August, I do the same and try to explain to him neither of those things will have been grown anywhere remotely close to our zip code. While I’ve begged for years to get our own garden started, outside of a few tomato plants and potted herbs, it hasn’t happened. So, while I’d love to take on the task of growing my own produce as much as possible, I’m very much reliant on buying at this point in time. As a Silk ambassador for the year, I’ve been asked to share an inspirational project from start to finish with you guys. After joining a CSA a couple of summers ago, I knew that wasn’t something I wanted to do again (the logistics of pickup were less than convenient and the price tag seemed hefty for what we got) but the desire to eat as close to home as possible for the months where that’s feasible (spring, summer & fall) was no less strong. I decided my inspirational project would be just that; an eight month journey through farmers markets and local seasonal produce, some recipes and some informational posts that will hopefully inspire you to do the same in your area. There’s nothing more disgusting than biting into a mealy stone fruit flown in from somewhere below the equator when it was hard as a rock or a tasteless tomato in March so here’s to 8 months of deliciously ripe, perfectly picked seasonal and local produce, the best of the best and refusing to buy into the mass marketed lack luster stuff lining our grocery store shelves. I walked into the farm stand store where I did the CSA out of a few years ago last week and I was honestly surprised at what was in there for it being May…not much. The weather had been in the mid 80s for a week or two at that point and I guess I just thought that would mean the place would be filled with spring greens and such. There was a lot of wintered squash, onions and potatoes but not much that screamed spring at all. Except these pea shoots. My love affair with pea shoots has been documented in this Thai pea soup and what wasn’t mentioned was how many trips I make to Trader Joe’s 40 minutes away just to buy them sometimes. So to find them 10 minutes from my house in a bag about 4 times bigger than the plastic container at Trader Joe’s was like hitting the jackpot. I knew I wanted to highlight the entire pea in this recipe and not just the pea shoot. It’s a wonderful spring vegetable that gets overlooked when everyone is going gaga over asparagus and artichokes but it happens to be my favorite. If you think putting peas in your dessert is weird, I’ll give you that, but just wait until you taste this filling. It’s light, creamy and bursting with lemony sweet pea flavor. 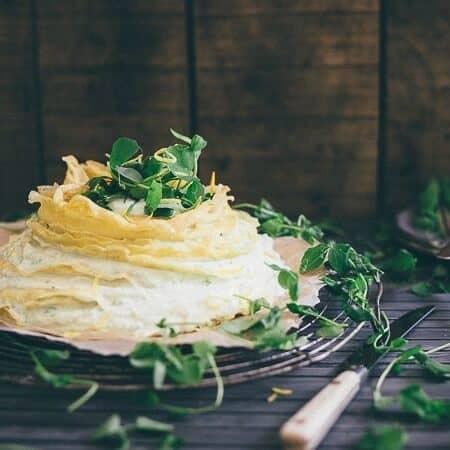 Layered between paleo crepes and topped with the gorgeous green pea shoots, it’s worth every minute of prep time and makes for a stunning centerpiece at any springtime celebration. Thanks so much to Silk <– sign up for their newsletter to get an instant coupon for any Silk product and be eligible for monthly giveaways) for giving me the opportunity to share this project with you! Make the crepes by whisking together the eggs, milk, coconut oil, vanilla and lemon in a large bowl. Add the coconut and tapioca flours and whisk until smooth. Set aside and heat an 8 inch non-stick skillet over medium-low heat. Once the pan is hot, spray lightly with baking spray and add about 3-4 tablespoons of the batter to the skillet swirling around so that the entire skillet is coated with a thin layer of batter. Let cook for about 1 1/2-2 minutes then carefully flip and cook another 30 seconds on the other side. Transfer to a cooling rack and let cool. Continue with the remaining batter, cooling and stacking the crepes as you go. Let the crepes cool completely (you can even do them the day before) before assembling the cake. Make the filling by stirring together all the ingredients in a large bowl. Place one of the crepes on the bottom of a cake stand or plate and spoon enough filling on top to spread a thin layer over the entire surface of the crepe. Place the next crepe on top and continue until all the crepes are used up. Garnish with fresh pea shoots and serve. This is the epitome of summer right here, Gina! This is absolutely beautiful! I adore lemon in summer time, what a treat! Your cake looks out of this world. Gorgeous photos! I’ve never seen anything like this! I love how you incorporated fresh produce into this. Great gluten-free recipe for summer! 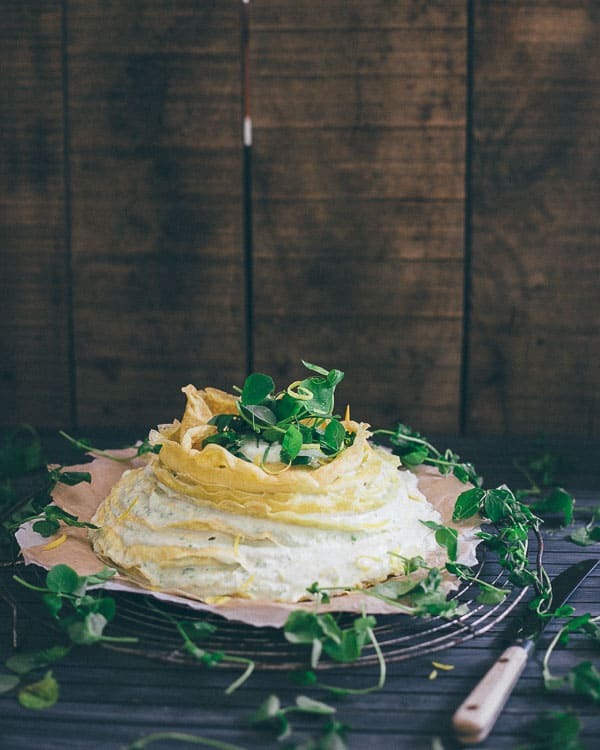 These are such beautiful photos and this is such a unique recipe! I love seeing things I would never ever think of. What a perfect late spring dish! Gina, this is by far my favorite post/recipe of yours ever! The cake and the styling and the photos are just incredible. I love it. I love that you did crepes savory. And the flavor combo – I bet i tasted and smelled fantastic, because it sure looks good! I love the matte preset you’re using Gina! It gives these images such a dreamy feel! This is such a creative way to use these ingredients. I want to throw a Spring brunch party just so I can serve these! 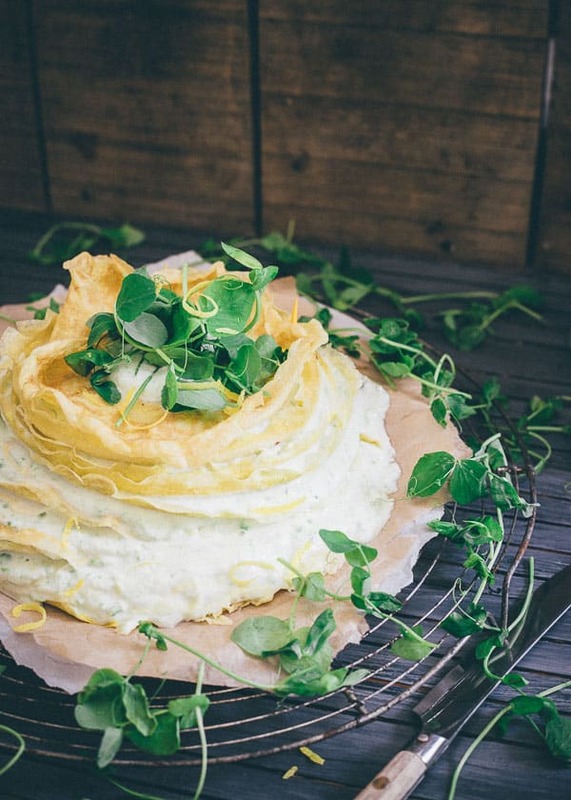 This looks divine and I so love pea shoots! 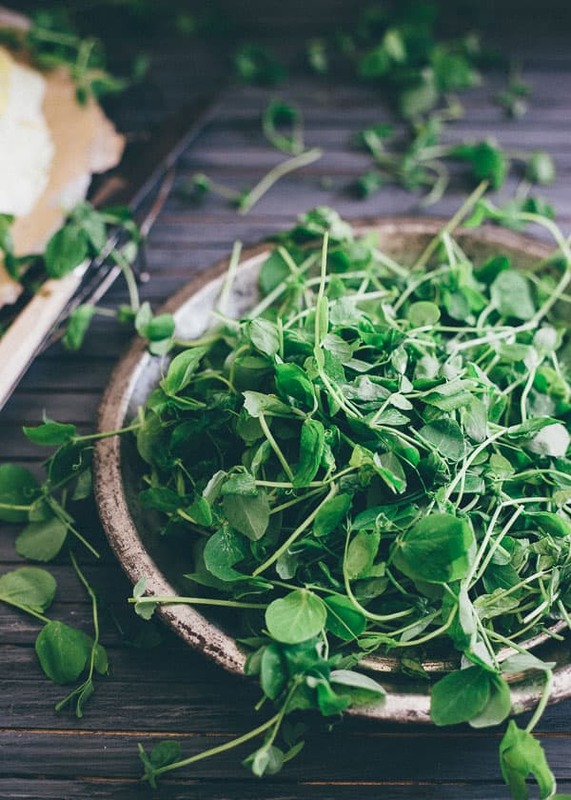 I first tasted pea shoots a few years back when my local farmer’s market had them by the pound and I brought huge bags home weekly and loved them with everything! Sadly that farm stand never returned after that summer and I’ve been stuck with tiny bags, for the same price I might add, from my local health food shop. Seeing your gorgeous photos, I was so sure this would be a savory treat, I imagined salty and creamy cheeses with a sprinkling of nutmeg. What I surprise to read on and discover you’ve presented us with a dessert, I would have never expected, but it sounds delicious, although I think I may try my own savory take on this as well as your sweet version. Thanks so much for the inspiration! I’ve also been dreaming of my sweet pea pesto which I plan to make and post very soon at http://www.sweetgreenkitchen.com.